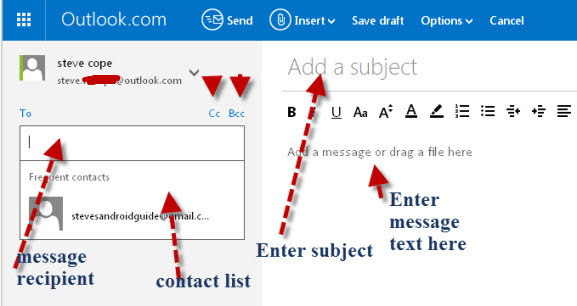 Composing and sending an Email in Outlook.com is relatively straightforward. 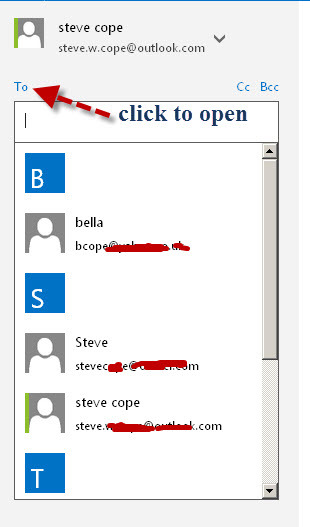 Here we go through the basics including using the cc and bcc fields, adding attachments, and using the contact list. 1. Login to Outlook.com mail. You should see a new message button in the main menu bar. The new message form is laid out differently than most email clients, as the recipient field is shown to the left of the message and not above the message. This layout give you much more room and is much clearer. In addition contacts from your contact list are displayed immediately below the to field. You should also notice the cc and bcc links above the recipient address(to) field. If you click the to link (above the recipient address field) then the contact list opens to display your contacts. You can select a contact from the list or enter an address manually. If you have multiple recipients on the to,cc or bcc line then they are normally separated by a semi colon or a comma. Note : You will only need to enter the semi colon or comma manually if you add the address manually. 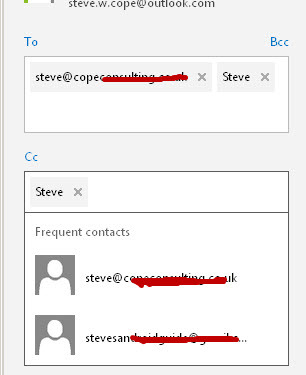 If you select the recipient from the contact list then the separator is inserted automatically for you. If you need to use the cc or bcc fields just click on the link and an extra recipient field appears. Display Names and Email Addresses. You should notice that recipient from you contact list are shown in address fields by their display name were possible. Email addresses are shown when no display name is available. 2. Enter Subject –Enter the subject of the email. All emails should have a subject. Not only is this Good email etiquette, but emails without a subject are usually blocked by spam filters. 3. Enter Main Message – When you enter the main message you should see a message formatting bar provided you stay in the default rich text. If you change to plain text or HTML (options in menu bar) you will loose the formatting bar. Usually you should stay with the default (rich text) and use Plain text only if you really need to. 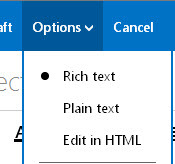 Although there are potentially compatibility problems with rich text, as only Microsoft clients support it, Microsoft will automatically convert the message to HTML before sending it to non Microsoft clients. See this support article for details. Above the message you will see a menu bar. Send to send the message. 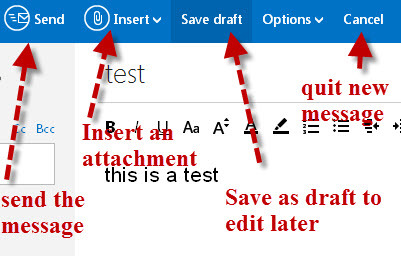 Save Draft to save the message as a draft so you can finish later. You can insert an image in the body of your email by click Insert>picture inline. 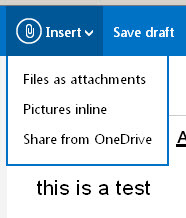 To add an attachment click insert and select files as attachments,If the file is on your computer, or share from OneDrive if the file is on OneDrive. If you use the file as attachment option (most common) then you are limited to about 20Mbytes. 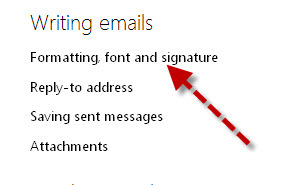 If you use the OneDrive method then you can send very large attachments, as they aren’t sent with the email. However you must first upload these files to your OneDrive store. If you are new to OneDrive then see this overview video . 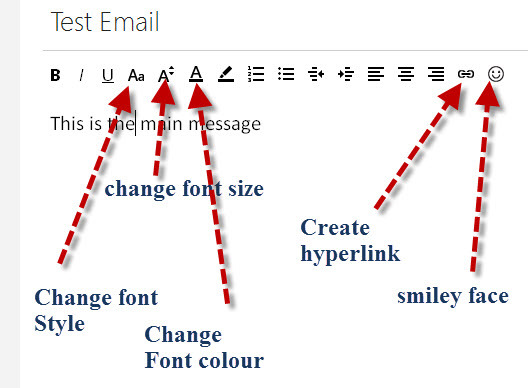 If you aren’t happy with the default font, and font size you can change it on individual messages or for all messages by going to the main Options>Writing emails>formatting font and signature. 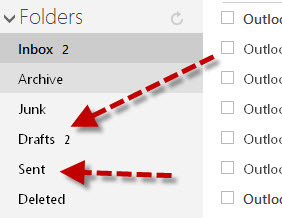 All sent messages will be stored in your sent items folder by default. Any drafts are stored in your drafts folder.